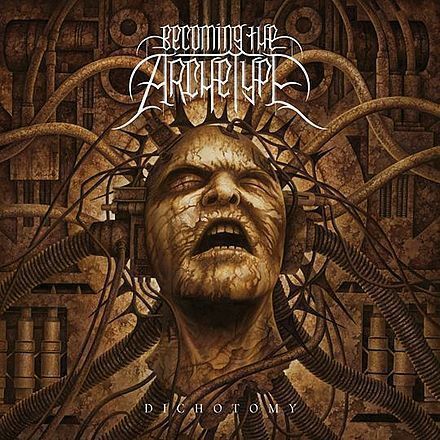 Today I'm going to review Becoming the Archetype's Dichotomy album. A thank you to my Aunt who bought this for me for Christmas this past year (2015). The album starts off with "Mountain of Souls". It starts with a pause and then erie backing vocals, but grows into something else later. In the middle when the clean singing hits the song is Devin Townsend of Strapping Young Lad, who also produced the album. The next song, "Dichotomy" starts with Vocalist/Bassist Jason Wisdom screaming: 'In this Hour, the Tower, SHALL FALL'. (Just brutal in the delivery) Around the two minute mark the song slows down, and in that time Demon Hunter Vocalist Ryan Clark, makes and appearance and collides his melodic vocals with Guitarist Seth Hecox melodies. "Artificial Immortality" is just a great song. A great song title too! It's very fast paced and probably my favorite song on the album. "St. Anne's Lullaby" is an instrumental track, but amazing none the less. The acoustic guitar is the only instrument on the track, and it has a very erie feel to it. The song "Ransom" is, according to Wikipedia, named after a character in the Space Trilogy by C.S. Lewis. "How Great Thou Art" is basically a metal hymn! I'm starting a band, so I know want to cover a hymn in metal! That would be awesome! Totally awesome! "Deep Heaven" is very interesting. It's very thrashy until the middle of the song, when Suzanne Richter comes in with her soprano vocals. It's very cool and interesting. "End of the Age" is the final song on the album, and it is an amazing song to end the album. The breakdown is pretty amazing. Great Metalcore breakdowns! But far from Metalcore in the same time! Note: I skipped one song, and that's one that I don't really remember. But it's awesome! Overall: This album is one of the best albums from 2008, (yes it's this old). The only album that would beat this, in 2008, would be........ Oh wait, there probably is no better album from 2008. Check their official website, follow the band on Facebook, Twitter, and Instagram, and their music on Spotify, YouTube and if you like it, go buy it on Amazon. Go check out the band, their other albums, and the members other projects!